This was originally posted on Reddit by PisseGuri82 who I’d like to thank for bringing our border date to international light. So, I was recently in a discussion about what is the oldest border. That’s not a hard question in itself (it’s Andorra). But what about number two? And three? And what’s the newest? And what regions, or which continent, have generally older or newer borders? I figured this had to be available information somehow. I was partly correct. Researching this has been painstaking, because a lot of the sources are fuzzy. Even the facts are fuzzy, different cultures have had different systems for defining a ruler’s area of influence and which rulers together form a larger entity. 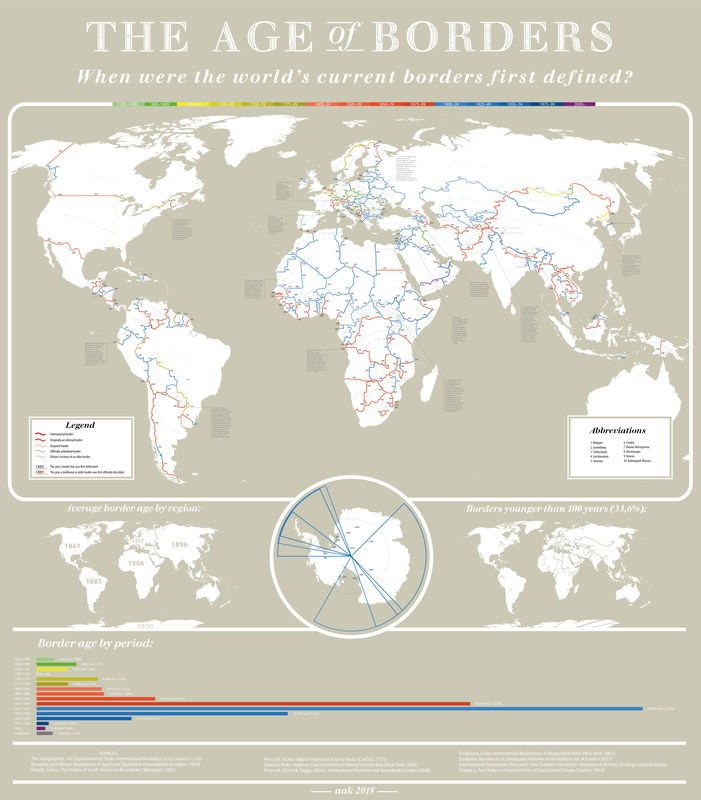 National borders as we know them today are closely tied to the age of the modern nation-state. In order to have some bearing point, I decided to try to find the first instance of a currently existing border being defined in official writing. Of course there are a lot of problems with that definition, so I will argue for and against it below. One problem is deciding when a border was defined in its current form. Firstly, pretty much every border has been minutely adjusted several times since its beginning. A map of which border was most recently adjusted would be interesting in itself, but that’s not what I’m going for this time. Secondly, I sadly don’t have access to the full text of every border treaty, so for this I’ve simply trusted my sources. That will skew some dates closer to the present. Some borders, like in Central America, have existed since colonial times but were vaguely defined and not properly mapped until very recently. That may give a wrong impression of e.g. El Salvador — an almost 200 year old nation — but it’s also interesting in itself that they operated with approximate borders for so long. Countering that, other borders have existed since ancient times (such as the Danube or the Scandinavian Mountains), but loosely defined and loosely dated if at all. I’ve found that dates like “Roman times” or “Viking times” are too vague. It also sets a precedent that is hard to follow up when it comes to ancient borders outside Europe where diplomatic history is even less documented (like the Mekong or the Andes). The definition I’ve chosen will help to secure consistency in the map to some extent. Not a lot of sources focus on a border’s “founding year”. Many sources about boundaries are legal, and naturally focus on the latest border revision, not the first. Historical sources, on the other hand, tend to focus on the border as it was at the time in question, mentioning only where relevant if this was the same location as today. For Europe there is a tendency to discuss the annexation of certain districts more than the actual treaty defining the border. These dates may be intermingled in some cases. I should also mention an inconsistency in the map which I’ve given a lot of thought and decided to live with. I’ve marked some borders as “originally internal borders”, to highlight the nature of the various colonial borders and former Soviet Republics. The problem is, a lot of borders, if not most, started out this way. One example is Acre State in Brazil. I suspect the border was set when it became a Bolivian state in the 1830s, but I don’t know exactly when or at what level of detail they were set. Realistically, to find out that I would need access to researchers, historians and translators who know the local archives. I know, however, there was a delineation when it became an international border in 1903 after the Acre war. So I will go for the earliest delineation I can find. As long as this is a project for fun, and not part of a thesis or anything, that is the scope I’ll settle for and say that this is a useful but not exhaustive category. But if somebody can point me to sources with dates for the Irish county borders or the first border treaty between the Habsburgs and Moravia, or Bohemia and Bavaria, or actually a lot of the tiny fiefdoms in Europe that somehow ended up forming a current border, I’ll be very happy to hear it. All in all, there will be mistakes here. There will also be dates people will disagree on. However, I’m hoping this overview gives an interesting look into how the concept of modern borders has spread throughout the world, in which regions they’ve meandered, where they’ve settled in and where they were simply imposed once and for all.